I found this beast in what I would call a junk store in Northeast Bremerton just before Christmas. Aside from sawdust all over it and a lot of wear on the case, it was in excellent condition and the shop owner was thinking of stripping off the keys and selling them for craft materials, since the “weird” machine was unlikely to sell for a good price intact. I just couldn’t let that happen, so I bought it. 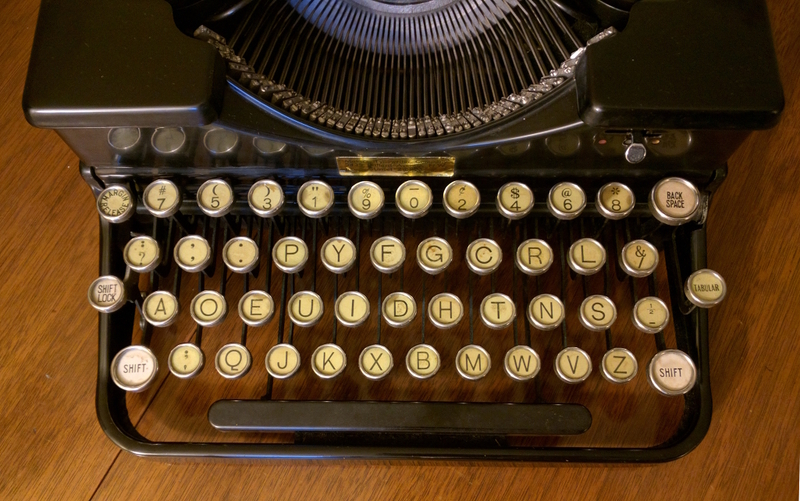 Not super-cheap, but certainly a lot cheaper than if I’d bought if from someone who was more “into” typewriters. I took it straight to the local repair shop–known for their knowledge of vintage machines–and left it to be cleaned and made serviceable. Today I got it back. I have named it “August” (or “Auggie”) in honor of Dr. Dvorak–who designed the keyboard arrangement. Auggie has pride of place on the vintage library table. We’ve determined that Auggie is a Royal Portable model (specifically an OT), built in early 1934, and shipped to the University of Washington. 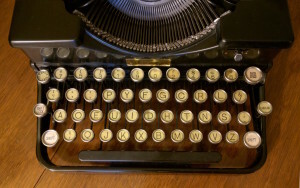 Dvorak keyboards weren’t a standardized item yet, since Dvorak’s patent was still in review (it was filed in 1932, but not granted until 1936). 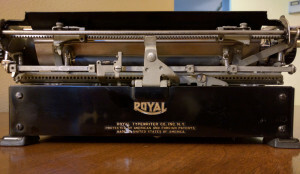 Paul, the technician and owner of Bremerton Office Machine Company, tells me that custom keyboards could be ordered at the Royal dealer’s offices by anyone, so long as they met a minimum order cost. A photo from the Museum of History and Industry in Seattle shows several of the older, heavier Standard “Model 10” Royal typewriters in use in Dr. Dvorak’s 1932 typing class at UW. I’m hoping to get in contact with MOHAI and the University’s archivists and see if I can discover more about Auggie’s past–not because it’s likely to be worth money, but because I’m a research hound and can’t resist a historical mystery. Auggie has an unexpectedly light touch, but a long stroke, so while I’m hitting the keys harder than they need, I don’t push them down far enough to get good contact on every keystroke. I don’t yet touch type Dvorak, so it may take a while to get up to speed on Auggie. I’m also trying to discover what makes the sub-type OT different from the parent model O, and I hope to find an owner’s manual for it as well. 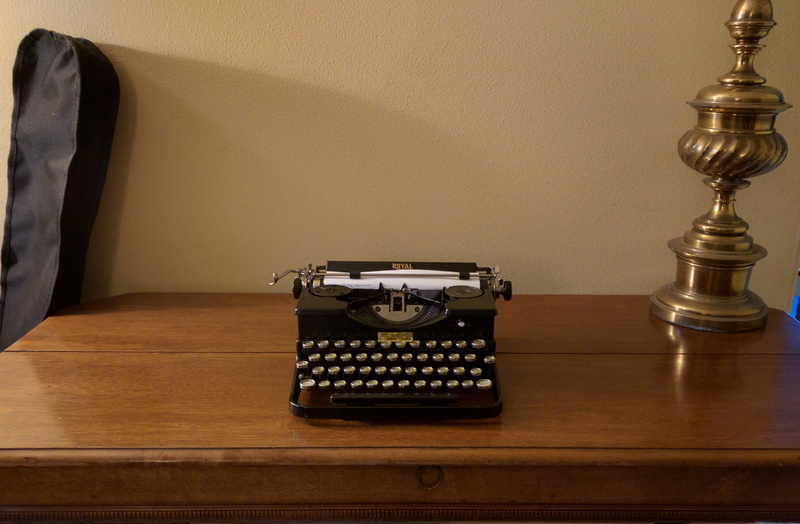 This isn’t a museum piece–the finish is imperfect, scratched here and there, foggy in some places, the keys are not enamel but metal with paper tags under protective glass disks, and the model wasn’t rare–except for the Dvorak layout–but it still makes me happy to have it lurking in the library.